Half in Europe, half in Asia, the historic city of Istanbul is one of the world’s greatest metropolises. Known in antiquity as Byzantium, it became Constantinople, the capital of the Roman Empire under the reign of Constantine the Great. It would remain the capital of the Eastern Roman Empire until its fall in 1453, when it then became the capital of the Ottoman Empire. “Istanbul”, from a Greek phrase meaning “in the city”, had been the common, if unofficial, name for the city since the 10th century, and became its official name when the Republic of Turkey was established in 1923. Istanbul–spelled with a dotted capital I, İstanbul, in Turkish—is situated in northwest Marmara. The historic Bosphorus Strait divides the city into its European and Asian constituent parts. Thanks to its topographical diversity, Istanbul has a number of sub-climates. Near the Bosphorus strait, the climate is Mediterranean, but farther up north it is colder and rainy. Generally, the city experiences hot summers and cold and wet winters. 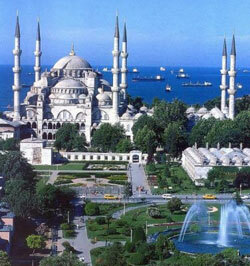 Turkey’s largest city is its economic and cultural centre. Its strategic location as an intersection of international land and sea trade routes contributed a lot to its rapid development. Being Turkey’s industrial hub as well, the city produces a variety of industrial products such as metal ware, chemicals, pharmaceuticals, electronics, and automotive parts. Istanbul is a major residential centre comprised of 27 districts characterized by an urban landscape. On the European side are Avcılar, Bağcılar, Bahçelievler, Bakırköy, Bayrampaşa, Beşiktaş, Beyoğlu, Eminönü, Esenler, Eyüp, Fatih, Gaziosmanpaşa, Güngören, Kağithane, Küçükçekmece, Sarıyer, Şişli, and Zeytinburnu. In Asia are Beykoz, Kadıköy, Kartal, Maltepe, Pendik, Tuzla, Ümraniye, Üsküdar, and the Adalar Islands. Most coastline communities in the districts bordered by the Bosphorus have many expensive beachfront cottages and luxurious chalet mansions called yali. 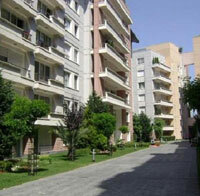 In Üsküdar and Kadıköy, modern residential areas and apartment blocks are home to a third of the city’s population. Among Istanbul’s most prized sites are the Sultan Ahmet Square, once the great Hippodrome of Constantinople and still a beautiful place to visit; the underground reservoir known as the Basilica Cistern; Topkapı Palace, which was the imperial residence for 400 years of the 600-year Ottoman Empire; and the 550-year-old Grand Bazaar, an enormous covered market filled with thousands of shops and sidewalk vendors.